Yeah yeah, we know, not all mother in laws are dry and sour. Some are actually quite tolerable maybe even sweet. But you get the picture. This Belgium style farmhouse ale is brewed with Japanese Sorachi Ace hops and spiced with Coriander, Orange Peel and Grains of Paradise. Thanks to special yeast type it is dry like English humour. Or your mother in law. Imagine her sourpuss face when she is not happy with you. That’s exactly how you feel when drinking this pretty Saison. Ronald de Waal aka the Flying Dutchman is a true NoMad brewer. With more than 20 years of brewing experience under his belt Ronald is one of the torchbearers of the craft beer movement. He has brewed beers in Finland, Holland and Belgium, partnering always with the best craft breweries. He loves to roam the road from one brewery to another and dream exciting new beer recipes. He loves the freedom of the road and freedom of choice. Cheers for that! The Flying Dutchman is a legendary ghost ship that can never make port and is doomed to sail the oceans forever. Ronald de Waal is a nomad brewer that can never make boring beer and is doomed roam the breweries forever. 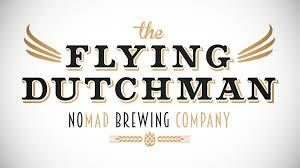 First beers from The Flying Dutchman NoMad Brewing are here for you to enjoy. Plenty more will come. They are all crafted with love. Cheers!